Before hatchlings, nestlings and fledglings start talking (calling) or singing (generally, if they’re males), their only vocalization is to beg for food. This starts immediately upon hatching as a faint whimper, but builds to crescendos as the bird grows. 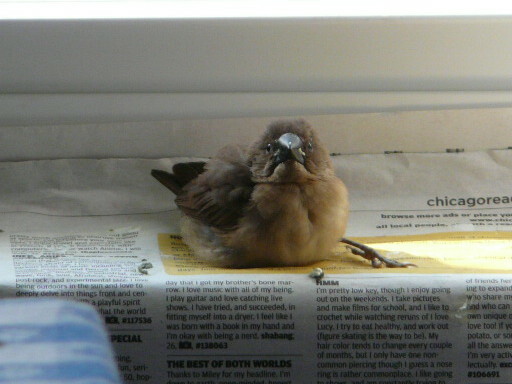 Attached is a brief recording of the only Spice Finch child produced in my house, begging for food. I named her “Little,” not knowing whether she would turn out to be a boy or a girl. Those strong little musical “peeps” you hear belonged to Little. As for the Mozart, I was trying to learn the Piano Concerto No. 21 in C Major, the one with the Elvira Madigan theme for the adagio, after hearing Stephen Hough play it so wonderfully with the Chicago Symphony. 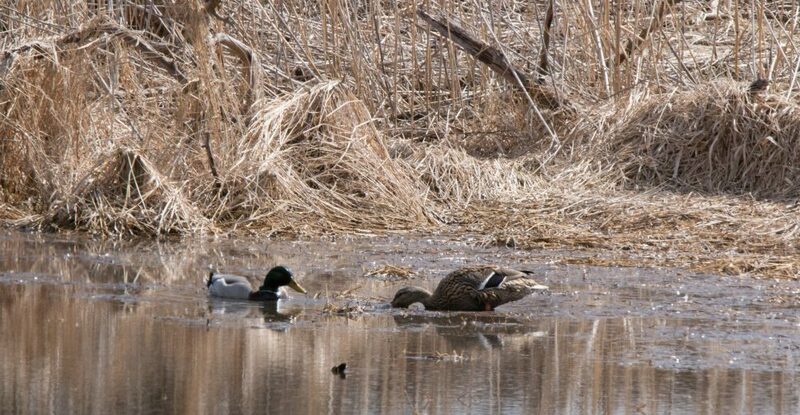 I didn’t have an orchestra to play with, unfortunately, only a recording of a nameless orchestra that was at its own tempo and, because I could not hear the canned orchestra over the piano unless I drowned out the birds, I gave up eventually. If I ever attempt this again, I will have to write my own cadenzas because the ones that come with the sheet music are dreadful, sounding more like Schumann than Mozart. Long before she fledged, Little fell out of the nest onto the floor. I picked her up and put her back, urging her parents to feed her. At that time she was no more than pencil eraser. 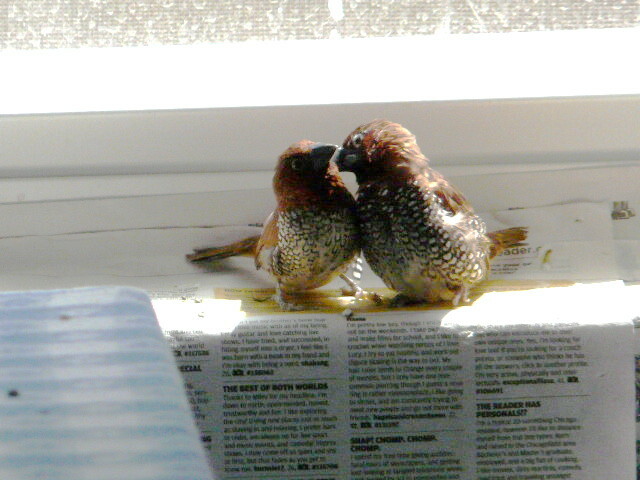 I don’t know what made her parents listen to me but they continued to feed her and she fledged, however awkwardly. Although I decided somewhere along the line that she was female, she didn’t live long enough for me to really find out. It wasn’t until she stopped begging and started getting around on her own that I realized she was physically impaired. She was missing her right foot, so whenever she landed it was difficult for her to sit without leaning over. It occurred to me this might have been why her parents kicked her out of the nest. They begrudgingly took over parenting of Little and she lived longer, perhaps, than she should have. But I think what did her in was her inability to fit in with all the adults. If she’d had siblings she might have had a better life, at least for a while, but I think she died of a broken heart. Once her parents stopped feeding her, they ignored her totally. 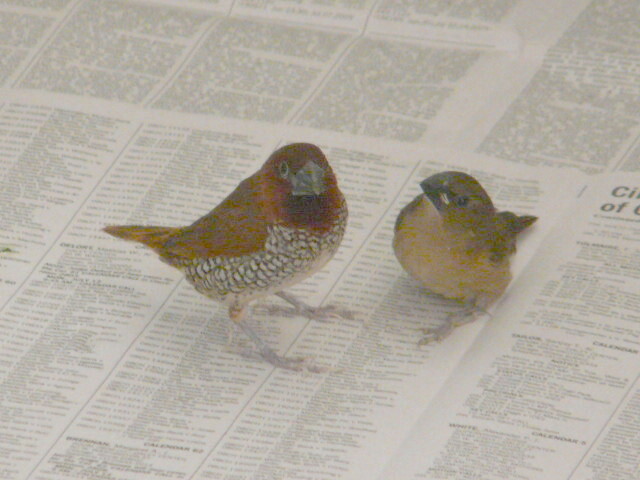 This entry was posted in bird love, birds, birds and music, birds in key, Fledglings, Mozart, music, Nutmeg Mannikin, Scaly-Breasted Munia, Spice Finch, Spice Finch Song by Lisa Rest. Bookmark the permalink.